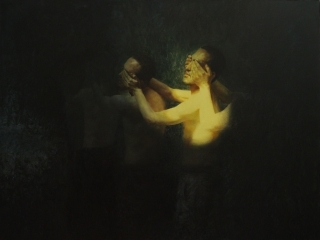 Li Ji Kai, born in Chengdu, Sichuan, 1975, insightfully explores the effects of the social illness plaguing today's China. 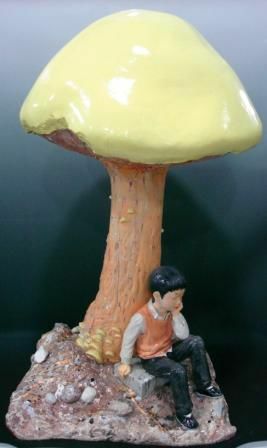 Through the physical manifestations of young Chinese boys in sculptures and paintings, Li illustrates their disengagement with their environment and the preoccupied self-indulgence that he observes in their daily lives. 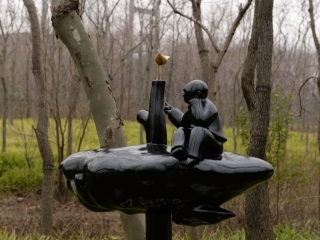 Li's works have been exhibited throughout China since 2002 in Beijing, Shanghai, Chongqing, Hubei and Guangzhou, as well as the "Path -China-France Exhibition" in Paris in 2004. In 1979, a state move administered a one-child policy throughout China which was responsible for the aforementioned social crisis. Widely regarded as a means of controlling overpopulation, the one-child policy gave urban mothers across China an overwhelming responsibility to bear a single heir to the family and their rural counterparts were only permitted a second child if the first-born was a daughter. Long treasured in Asian cultures, a son is preferred to carry on the family name and eke out a living, contributing to the family income, leading to the demise of daughters through forced or selective abortions and female infanticide. Whilst Chinese youth in the 1960s and '70s were encouraged to goad each other towards ideological fervour and join Red Guard groups to unleash Mao's brand of political terror, the post-revolution generation was pampered with consumerism, technology and driven by individualistic desires. Coined as Little Emperors and Empresses, they no longer rallied round political gods; and chose instead to embrace Deng Xiaopeng's Four Modernization views and open economy to obtain the money they desired. 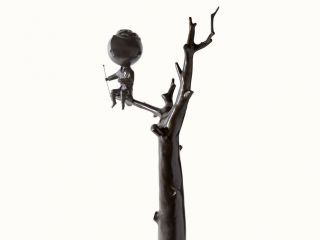 Their languid self-importance is seen in his sculptures such as 'Relief' where an issue that would be natural and considered a personal duty is taken for granted - perched atop his lavatory throne, he is aloof without urgency in the knowledge that he is comfortable. 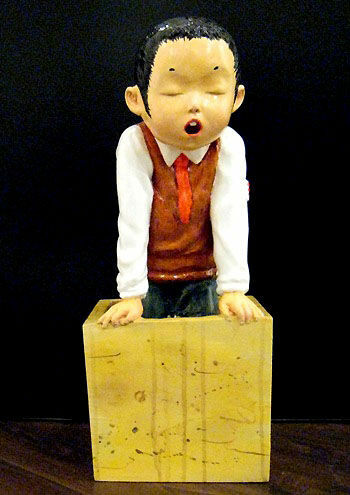 In 'Box', the heavy-lidded eyes depict a mind sluggish from inactivity and laden with the mark of capitalism. Perhaps they are indeed dreaming as their incapabilities cannot sustain a bright future. 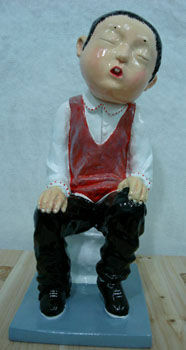 In all his sculptures and paintings, the boys are well-dressed as affluent Chinese parents shower their only offspring with excessive luxuries that the children see as their birthright to receive. Besides overpopulation, the policy attempted to counter China's depletion of limited natural resources, aggravated by the heavily-industralised Mao regime. 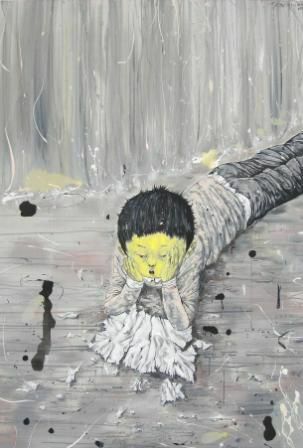 Li's "Breathing Exchange" series of paintings depict the post-revolution generation of little emperors languishing amidst rampaged landscapes and polluted air; a harbinger of the gloomy future that lies ahead. 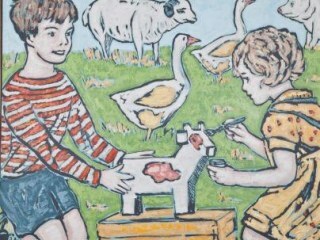 Li's academic involvement in animation reveals itself in the style of the "Breathing Exchange" works, revealing influences from avant-garde, street art and freestyle illustrations associated with digital graphic design.